X2Net WebCompiler 3.0.0.86 free download. X2Net WebCompiler 3 is a very powerful HTML compiler. X2Net WebCompiler 3 is a very powerful HTML compiler. X2Net WebCompiler 3 is a very powerful HTML compiler. It takes a group of HTML pages (a website) and transforms them into a single executable file. The file is a stand-alone entity, it requires nothing else to enable an end-user to run it. (Although the user must have Internet Explorer 4 or above on his system, but it need not be the default browser). The HTML and graphics are highly compressed to give the smallest possible output file. They are also encrypted to prevent end-users accessing the source HTML. X2Net WebCompiler is perfect for distributing sample websites, product brochures and all manner of other information in a secure and compact way. WebCompiler presentations re-use the Internet Explorer browser (V4 or above) that is on the end-users system, so with a few minor exceptions support any HTML that IE itself can. You can actually run the compiler from the command line, or a batch file, or call it from a program of your own. It can be implemented as part of an e-commerce solution where compilation occurs as part of an e-commerce transaction. Compiler Options can be changed for each compilation by simply modifying the plain text file that they are contained in. Software Passport from Silicon Realms is a powerful Digital Rights Management system that can protect your presentation from hackers and crackers and provide Try-Before-You-Buy capability based on number of days, uses and a range of other options. WebCompiler presentations support forms, but there has to be some way of getting the data the end user enters back to the presentation creator securely. WebCompiler (optionally) uses industry standard dual key cryptography with 128 bit keys making the transmission of sensitive information by e-mail just as secure as a secure web site. You can protect individual pages of your presentation, or complete directories, and require that access needs a username and password combination. This combination can be the same for all users, or different username/password combinations can be used for different users. Once you have your presentation in the end user's hands it would be nice to be able to install it on his system. 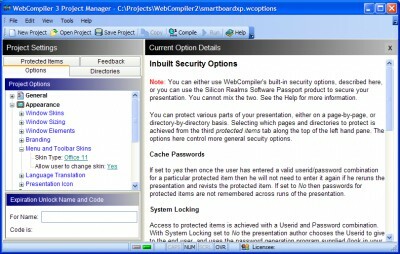 WebCompiler has it's own built-in installer that you can call from a page in your presentation, which will install your presentation, provide icons for it in both the Start menu and the Desktop, and also provide an uninstaller to allow the user to easily uninstall your presentation should he wish to. WebCompiler can optionally write an autorun file that will cause your presentation to execute automatically from a CD as soon as it is inserted (assuming the end-user hasn't disabled that capability on his system). It is not possible to view the source HTML. The source HTML is NEVER copied to disk or placed in the browser's cache. (If you are looking at alternatives make sure they don't just copy all the HTML to a temporary folder and delete it when they have finished, very insecure!). WebCompiler fully supports Forms. The results of data entered into those forms can be e-mailed back to the presentation creator (securely if encryption is selected). WebCompiler presentations can optionally include very powerful searching capabilities, with wildcard support (* and ?). Searching for occurences of a word across 1,000 HTML pages can usually be achieved in under a second on a P2/400. The results of the searches can be presented to the user using a user-defined page that will maintain the look and feel of your presentation. The individual search terms that matched are highlighted on the page. Kiosk Mode is removes all the user interface controls and makes it impossible to break out of on Win9x systems. Ideal for point-of-sale use or in other public places. Almost all aspects of the look of the interface can be controlled, from Windows sizing through to the presence or absence of user interface controls such as menus and toolbars. Presentations can be set to expire after a particular date, a particular number of days since first run, or a particular total number of runs. You can generate name/code pairs to override the expiration options. You can specify a particular page to be shown after the date has expired, presumably to advise the user how to purchase a license or get a newer version. Accessing multiple separate items such as an HTML page and all the graphics etc. that it references can take a long time on a slowish device like a CD. WebCompiler has sophisticated caching built-in to speed up page loading significantly. You can specify your own Icon to use for your presentation. This icon will also be used by the built-in installer and therefore appear on the user's desktop and in his Start Menu if you choose to use it. Smart Address is a software application that will provide powerful Contact Management for single or multiple users across both local and wide area networks. X2Net Smart Address provides powerful Contact Management for single or multiple users across both local and wide area networks. X2Net Recent Documents will help you to ever lose track of a file again! X2Net Recent Documents automatically keeps track of every document you use. unWC is an exe ebook decompiler, unWC can decompile any exe ebooks which were compiled by Webcompiler and will extract all source files from the ebook! How does it work? Run unWC, Simply select an ebook which was compiled by Webcompiler, select a folder for output, press the 'Begin to extract' button, and in a short time you will get all source files of the ebook (these soucre file are saved in the folder you've selected)! With unWC, you also can decompile those ebooks in a batch: select a folder that contains . SiteInFile Compiler will help you to create professional presentations, cd autoruns and eBooks using SiteInFile technology. This award-winning program allows you to create password protected HTML pages and hide the source of your pages. WebPassword is a software which protects your web pages with password (HTML password protector). Right Autorun Pro creates presentation slides and autorun CD. As we move into Information Age, each of us becomes a part of this new Hi-Tec world. HelpBuilder is a tool which creates and maintains Windows Help files. AnetHelpTool is WYSIWYG help-authoring system for creating Win/HTML/Java Help files, RTF Manuals and Web sites.